Luxury motor yacht JANTAR was built in 2003 by Fipa Italiana Yachts, she is a signature Maiora design from the established Italian fleet and measures 20.8m (68ft). 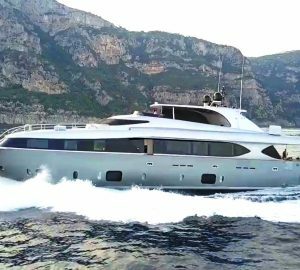 Offering a contemporary interior décor and ample exterior living, the JANTAR motor yacht is available for deluxe crewed yacht charter, for up to 6 guests. The salon and dining aboard the yacht JANTAR is light and airy, featuring warm wood panels, cream furnishings and large panoramic windows, for ample natural light. A comfortable lounge with coffee table and apposing entertainment center is ideal for indoor entertainment. Forward of the salon is the galley to port, followed by a formal dining to starboard and the pilot house. Guest accommodation is in 3 cabins on the lower deck. 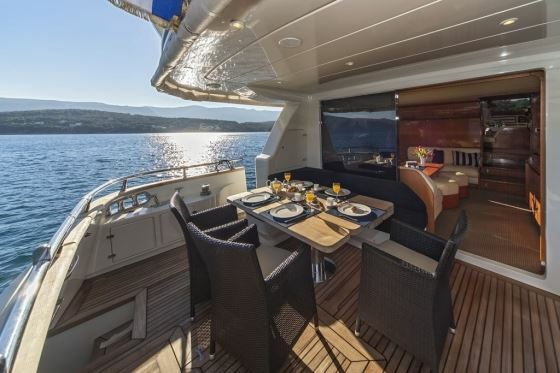 Exterior living on the Italian built Maiora yacht JANTAR is on 2 well-appointed decks. Adjacent to the salon is the shaded aft deck, featuring an alfresco dining option and generous seating area. For the water enthusiasts, an extended swim platform is ideal for effortless water access. 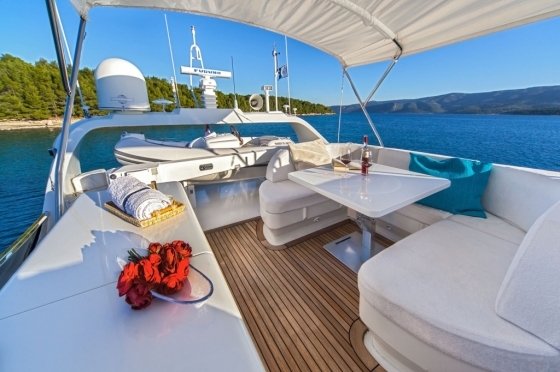 Wrap around main decks lead forward, where on the foredeck is a large sunpad, eagerly enticing the sunlovers. The upper deck boasts optional shade, an alfresco dining table, seating, wet bar with BBQ and double sunpad. 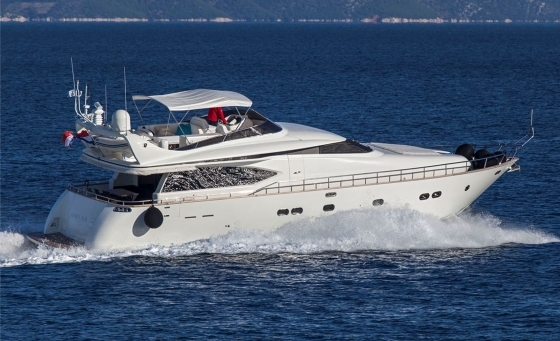 Powered by 2 x MTU 1250hp engines, the JANTAR motor yacht cruises at 22 knots, with top speeds of 28 knots. 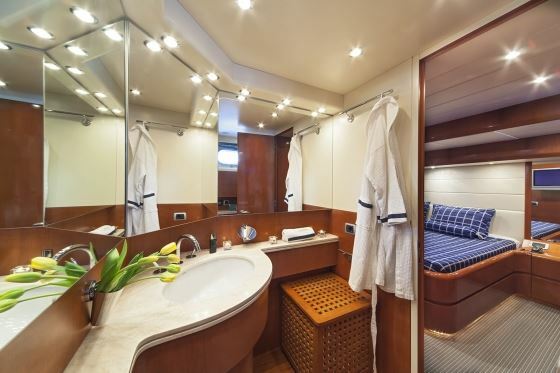 Below decks the luxury crewed charter yacht JANTAR offers spacious accommodation, for up to 6 guests, each with private en-suite facilities. 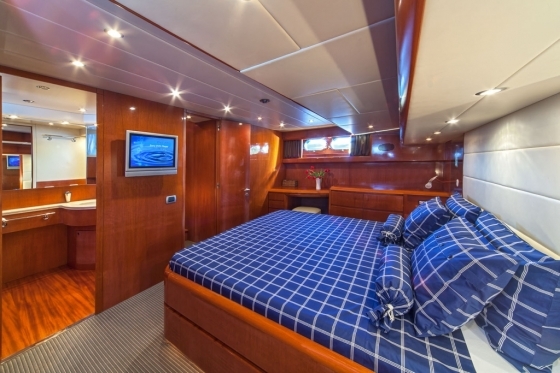 The master stateroom is amidships and full beam of the yacht, with a center lined double bed. 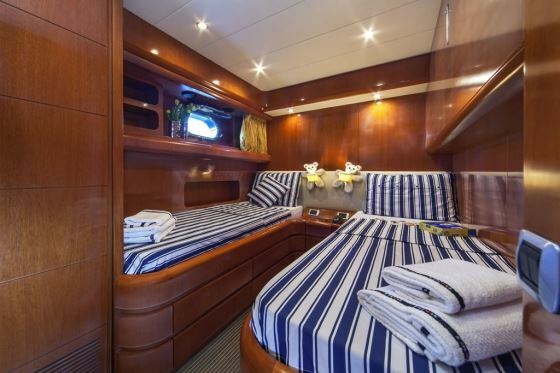 The VIP is forward and full beam of the yacht, with a center lined double bed. 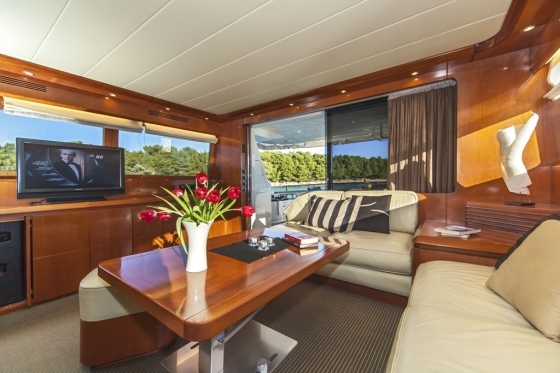 A guest cabin amidships and forward offers 2 side by side single beds. Toys include Yamaha JetSki, water skis, wakeboard and snorkelling, and wifi is available onboard.